One cannot fix one’s eyes on the commonest natural production without finding food for a rambling fancy. Our meeting on January 18,2017 at the South County Regional Library in Estero, Florida featured Mr. Jerry Vetowich discussing “Jane Austen’s Bad Boys.” As Jerry noted, he is a long-time member of JASNA in New York and has a great love of Jane Austen’s works. Jerry began his talk by referencing Luigi Pirandello’s “Six Characters in Search of an Author” (see below); Jerry feels that Austen’s characters are real people and stressed the beauty Austen created in her sentences. Jerry pointed out how across the books are named alliterations; for instance, the use of “Will.” in William & Willoughby, Brandon (boring Bran), Wentworth (yes he Went), etc. 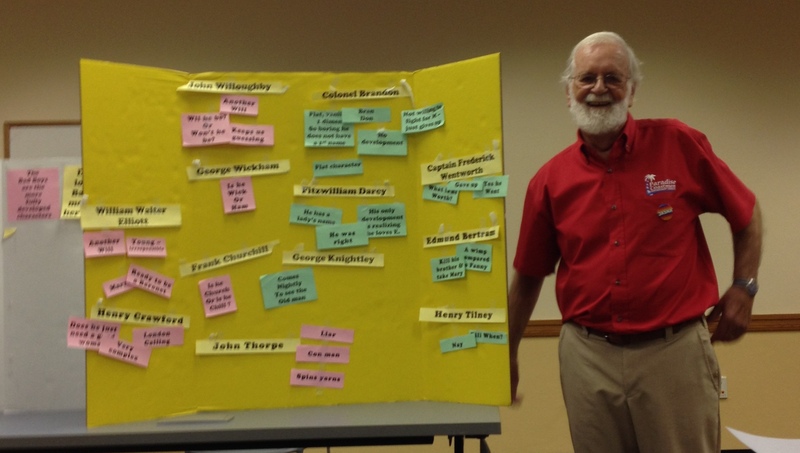 He then showed a thought-provoking visual illustrating the contrasts between Austen’s “heroes” and “bad boys.” The members then enjoyed a lively discussion pondering whether Austen truly preferred her bad boys to her heroes (many members seemed to agree with Jerry’s assessment). Yes, that is the word!